The original Suspiria’s imagery and sound was much more terrifying than this remake. There are some images that are certainly disturbing but nothing that stayed with me the way some images from the original did. Maybe it was also the fact that I had spent 3 days watching movies like Suspiria that I had become desensitized to the horrors of this remake. That isn’t to say the movie is bad, it’s just to say it didn’t stick with me the same way the original did on rewatch a few weeks ago. The set pieces are brilliantly crafted though. The dance numbers are shot in a manner that always feels far more dangerous than a ballet performance should. An early scene that is glimpsed in trailers where Suzy’s movements in the studio are contorting a young dancer’s body elsewhere in the studio is shot and edited flawlessly. The climax is as bloody and insane as you would expect but still left me wanting something more. I don’t know what was missing from the movie for me. I think it was a very well done film that everyone else seems to love unconditionally. I found it to be creepy and do a lot of little things really well but in the end, all those little things didn’t add up to me thinking about the movie more than 10 minutes after I watched it. The Video: Suspiria comes with a 1080p HD transfer and is presented in 1.85:1 aspect ratio from Lionsgate. Like the original film, the bold and vivid colors go well with the intense and sharp detail with a wide spectrum of colors. That being said, this new remake tends to travel with more of a neutral tone throughout the film of browns and beige everywhere, which truly accentuates the brighter primary colors in each scene, especially red blood. The original film was steeped in every bright color on the table, but these are two different visual styles here. The different natural tones on the walls and floors both are well saturated and balanced and give a very warm yet haunting look. When the bright reds, blues and greens come into play though, you’ll really see the best of the color here that just pops right off screen. Detail is quite sharp throughout most of the film, with a ton of good closeups that that showcase facial pores, wrinkles, and some great practical makeup effects. Individual hairs and textures in the costumes all look great too. Black levels are deep and inky and skin tones are always natural. There were only a couple of instances of banding, but it didn’t last long. This is a fine looking video presentation. The Audio: For the win here, Lionsgate gives us a perfect Dolby Atmos track for this scary, haunting remake and I couldn’t be happier. A lot of the film has some super creepy breathing from some nefarious characters. The Dolby Atmos track only enhances these breaths, because you’ll think they are above you, behind you or right in front of you, with varying degrees of volume levels. It works to a dramatic and horrific effect. I loved it. Other creaks in floors or doors sound off nicely and robust as well. Thom Yorke’s score pays homage to the original Goblin soundtrack while using some of his own techniques with some good crescendos and frightening musical cues that always add a sense of dread to each scene. Other ambient noises of people talking or yelling across the halls or a in a big room sound great from the rear speakers and are always well balanced. Dialogue is clear and easy to follow along with some excellent directionality. The low end of bass kicks in with the musical score quite often too that adds some depth to this audio presentation. There were no issues with this Dolby Atmos track at all. I quite liked it. The Making of Suspiria (HD, 4 Mins.) – A short EPK fluff piece with cast and crew talking about the plot of the film and Dario Argento’s original film. Too short and not enough info here. The Secret Language of Dance (HD, 4 Mins.) – This focuses on the choreographer of the movie Damien Jalet and how his unique dancing brought a story to the film. The Transformations of Suspiria (HD, 5 Mins.) – The best part of the bonus features, but again all too short, are these glimpses at all the cool makeup and practical visual effects that went in to the film. 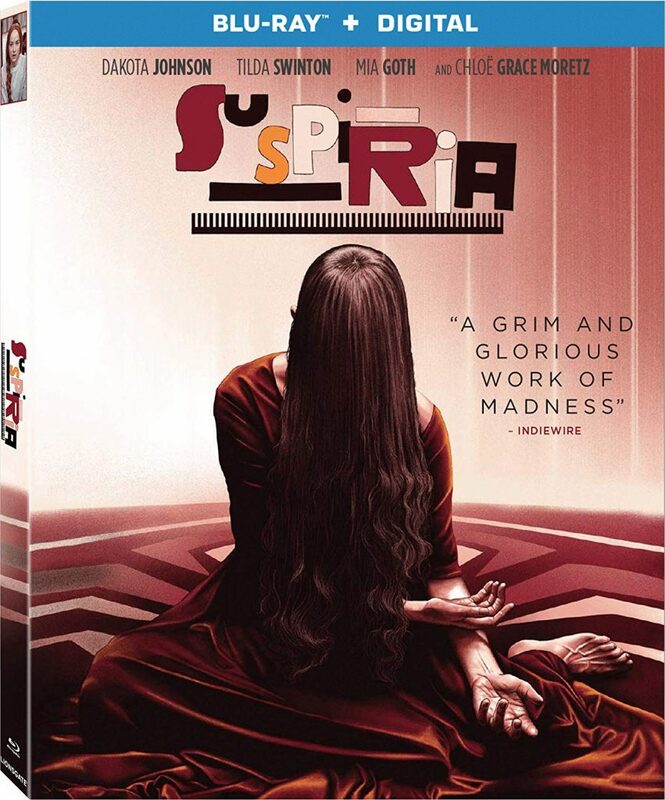 This remake of Suspiria is a decent remake that deserves to stand on its own. It pays tribute to the original Argento opus while having a few of its own tricks up its sleeve both in narrative and visual style. The score is also good here too. It’s a decent horror film, but if you care to compare it the original, you’re always going to find problems. Instead, just enjoy this one for what it is. The video is quite good and the Dolby Atmos track is unbelievably good. There are only a couple of short extras here, which are not that in depth. Still, if you can find this for the right price, give this one a shot. Recommended! This entry was posted on Tuesday, March 19th, 2019 at 10:19 am	and is filed under Film, News. You can follow any responses to this entry through the RSS 2.0 feed. You can skip to the end and leave a response. Pinging is currently not allowed. « Climax – My Bloody Podcast #42!